Here's your ticket to a '¬?round-the-world journey with a most unusual tour guide. Departing from Sarah'¬?s bedroom, her yawn makes an eastbound tour of the globe through Cuba, France, Chad, Russia, China, the blue Pacific, Peru. . .and beyond. Will it ever stop? 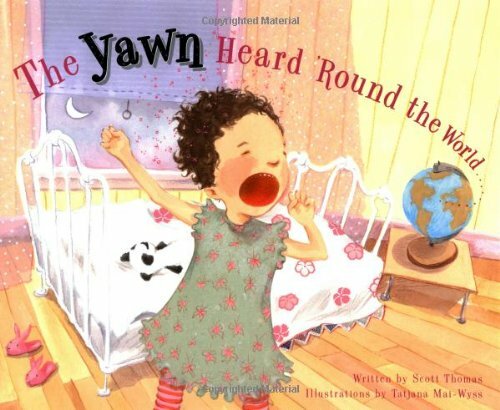 !Bouncy rhymes and watercolor collages enliven each episode in this contagiously funny tale of a silent phenomenon familiar to even the most wide-awake sleepy-head in the world. Lift the flap to reveal the yawn'¬?s final destination. Spirited yet appropriate for bedtime.Teaches some light geography. When he'¬?s not too sleepy, SCOTT THOMAS likes to juggle balls and clubs and think up adventures to try. A first-time children'¬?s book author, he works for a newspaper and lives with his family in Buffalo, New York. TATJANA MAI-WYSS lives in New Haven, Connecticut, with her husband, new baby, and crazy cat, Friday. This is her first picturebook.